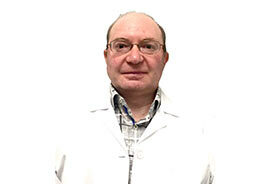 An internal medicine specialist since 2001, Ilya Smuglin, MD, lives to serve his patients. Even before he was an MD, he was on the front lines of the medical field, working as a counselor for emotionally disturbed children. Now, he focuses all of his energy and efforts helping you get well. Dr. Smuglin obtained his Bachelor of Arts degree from New York University. Then, he earned his medical degree (MD) from St. George’s University School of Medicine. He completed his fellowship in internal medicine from Lutheran Medical Center. Dr. Smuglin has been affiliated with a number of hospitals, including Woodhull Medical Center and American Medical Center. He is a member of the American Medical Association, the American College of Physicians and the American Society of Internal Medicine. A U.S. citizen, he is a stand-by volunteer of Homeland Security. He is fluent in English and Russian, and he has a working understanding of Spanish. Experience the difference at Century Medical and Dental Center.